5 delightful color combinations make it visually appealing. The Falcon Elite 5 is a great casual shoe for everyday use, based on comments from a large majority of users. The responsive features of the shoe really impressed many runners. The Adidas Falcon Elite 5 tackles distances ranging from 5Ks to marathons with ease, remarked several runners and testers. The spacious toe box delighted runners with slightly wider feet. A few runners noted the appearance of wear and tear sooner than expected. The high heel drop may be a bit much for some. Adidas offers its usual flair for producing running shoes that can match the appeal of those designed purely for fashion in the 5th version of the Falcon Elite. It is a surprisingly very affordable shoe that offers sufficient arch support for road and track racing. Similar to the popular Adidas Ultra Boost, the Falcon Elite 5 can be worn casually or for daily training. I really like this shoe because of the ventilation. Moving on to durability… they're not too durable. It's comfortable. It's not as comfortable as boost but it feels like walking in the cloud. The Adidas Falcon Elite 5 is hugely different in design from the Falcon Elite 4. The newer version harkens back to a simple and less explosive design. The upper doesn’t use bonded or welded overlays and the mesh material is clearly bare on the surface. The overlay system is a stitched on layer that encompasses the entire mid-foot area. The tongue of this version is actually part of the upper fabric, bringing runners a singular unit that’s free from slippage. This integrated tongue has a design that extends to the lower leg, fully protecting the entire foot and a portion of the lower leg itself. A heel tab helps in wearing and removing the shoe. It was also designed to be higher than the collar, thus allowing it to fully secure the heel area and add a bit of support for the posterior area of the lower leg. 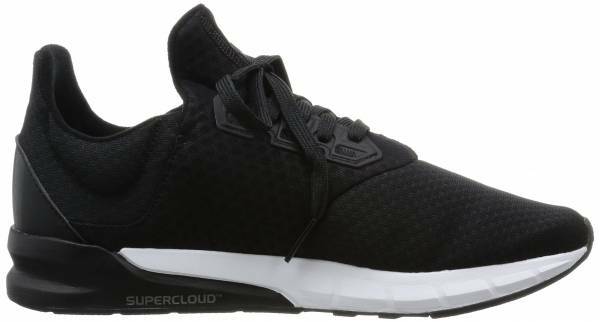 The mid-sole unit features the SUPERCLOUD™ technology, which provides responsive cushioning, a bouncy feel to the platform and long-lasting comfort throughout every activity. The outsole unit is able to provide durable protection against wear and abrasion, as well as traction over the roads. But it’s also flexible, affording the runner with the capability to move freely through the gait cycle. The Adidas Falcon Elite 5 is one size smaller than the regular sizing scheme, but comes in a variety of sizes for more choices. It is recommended to get one size bigger to achieve the correct length. It has a medium-sized heel and mid-foot area, and the forefoot section has a more rounded shape, thus giving more space for the toes to naturally spread and have wiggle room. The outsole unit uses flexible rubber, which encompasses most of the external surface. It delivers durable protection against wear and tearing and also delivers traction over the roads. The Waffle design of the outsole is able to distribute pressure when the foot is on the ground. It balances the platform. It also makes sure that all areas of the outsole are able to receive equal amounts of protection, as well as flexibility. The mid-sole unit has a full-length foam that’s responsive and efficient. It delivers cushioning that’s comfortable and durable. It doesn’t break or wear off easily. Its thickness provides the wearer with the right amount of cushioning while also allowing the platform to become more flexible. The SUPERCLOUD™ technology is placed in the heel section of the Adidas Falcon Elite 5. This technology provides the heel with more support. Its soft nature cradles the heel and delivers a plush feel that doesn’t lose integrity. Heel striking becomes more comfortable as it handles the pressure when landing the foot on the ground. The upper unit features a mesh material that’s soft and breathable. Air seamlessly enters this fabric to keep the foot cool and dry all throughout the activities. The forefoot area doesn’t have any added layers, therefore allowing the forefoot more freedom of movement. The overlay system which surrounds the mid-foot area is made from breathable textiles that seamlessly integrate themselves to the entire upper unit. They secure the mid-foot by reacting to the adjustments made to the lacing system. The high-cut tongue is actually part of this system as one singular unit. The mesh lining is soft and breathable. It wraps the foot well and doesn’t cause irritation. Some padding is placed in the collar and tongue, thus securing the foot well and giving an overall plush feel.